While the rest of the United States gets prepared for the coming spring, fearsome winds and temperatures hitting ‘twenty degrees celsius’ below zero are still lingering here, a place in the true north, Alaska. About one-third of Alaska lies within the Arctic Circle. The destination provides opportunities of unique tourism and exploration, like Arctic sightseeing and the once in a lifetime, Aurora Borealis (Northern lights) watching. The Coldfoot Camp is run by the Northern Alaska Company. Halfway between Fairbanks and Prudhoe Bay,it is the only lodge for travelers to stay overnight in Alaska’s Arctic. Photo by Xuan Ma. Northern Alaska Tour Company is the only agency to provide tours and services inside the Circle. 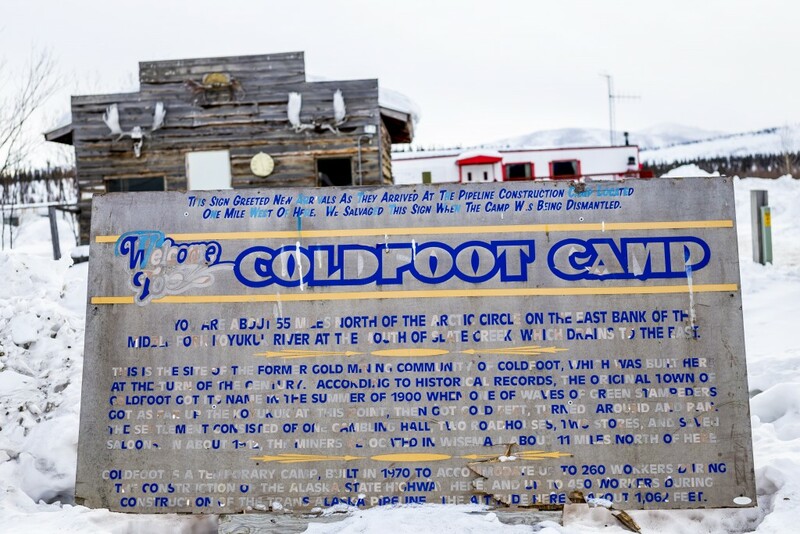 On Tuesday, 8th March, 14 tourists were grouped for a trip heading all the way up to Coldfoot, where the company runs a camp of 52 rooms in the Arctic Circle. 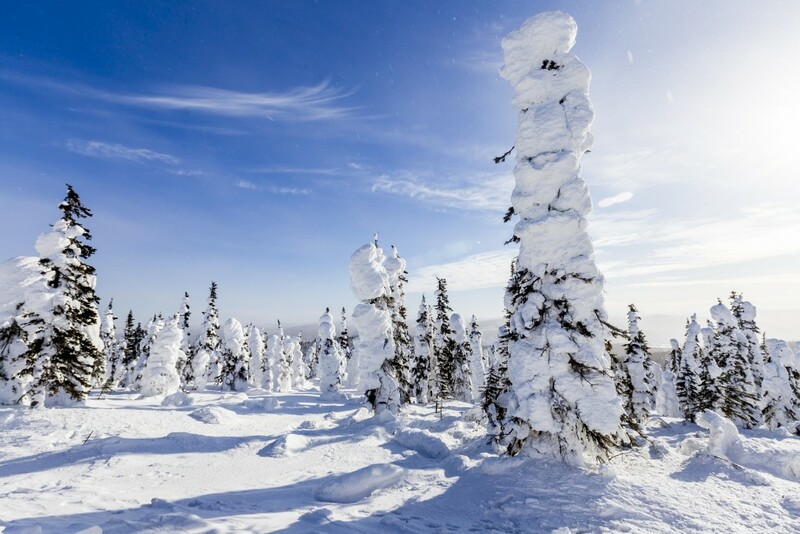 Fairbanks, the northernmost metropolitan area in the United States located less than 120 miles south of the Arctic Circle, was the beginning of the 10-hour bus trip. From here, tourists went along the main road into the Circle, Dalton Highway, one of the most isolated roads in the United States. Thanks to the thriving oil drilling development, it was built along the Trans-Alaska pipeline system connecting 12 pump stations. 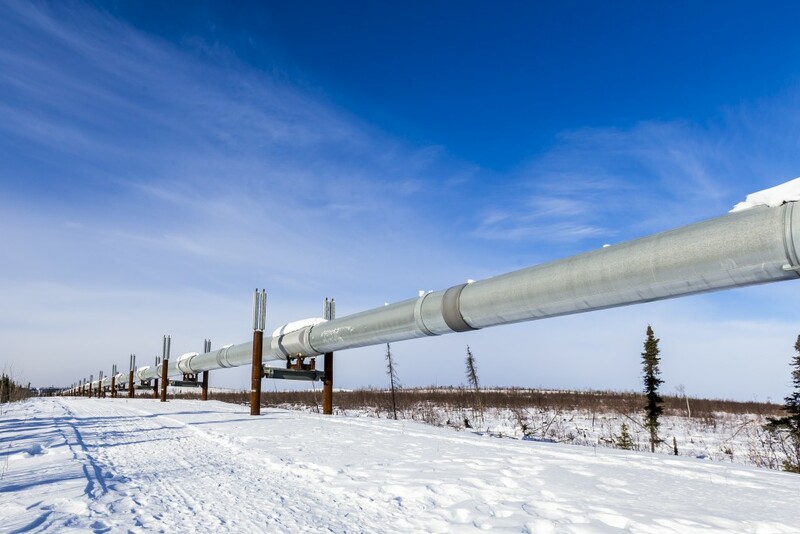 The Trans-Alaska Pipeline System is one of the world’s largest pipeline systems. The pipeline is as long as 800 miles. Photo by Xuan Ma. 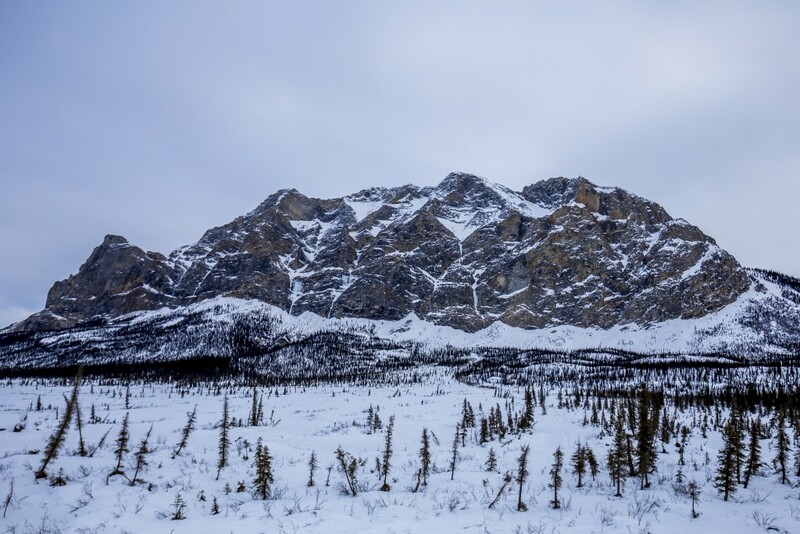 The pine trees along the Dalton Highway wear thick coats of snow. Due to the force of strong wind, the snow is shaped like marshmallows. Photo by Xuan Ma. From North Fairbanks to Coldfoot camp, the view alongside the way displayed a great example of latitude biome distribution. Up to north, the road wound its way through dense pine forests, bald spruce woods, short dark bushes, shrubs, meadows, and tundra. Beyond the tree line, the land was all covered by fluffy and thick snow with little plants coming to life. After a seven-hour driving, the bus made a stop at the Arctic Circle line. A wooden sign is set up over a tiny slope, showing the map of the Arctic Circle. Tourists received a “crossing the circle” certificate signed by the tour company. Each of them took selfies with the sign behind and the paper in hand. The temperature dropped apparently, and the stronger wind blew up snow on the ground. Snow gloves and thick scarves were taken out at this point. 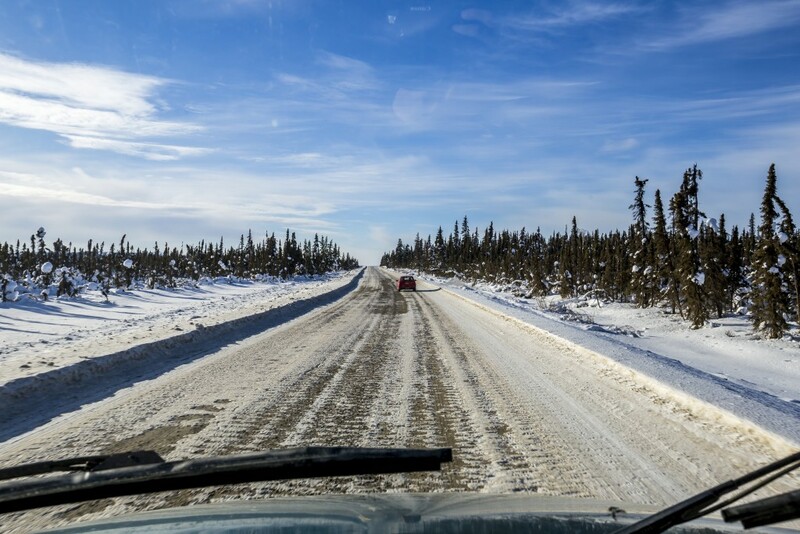 The Dalton Highway in March is still covered by ice and snow. Directly paralleling the pipeline, it is one of the most isolated roads in the United States. Only three towns are connected by the route: Coldfoot, Wiseman, and Deadhorse. Photo by Xuan Ma. At dusk, the bus finally reached the Coldfoot camp. The camp that accommodated the whole tourist group was originally served as a lounge for the truck drivers who drove back and forth along the road. 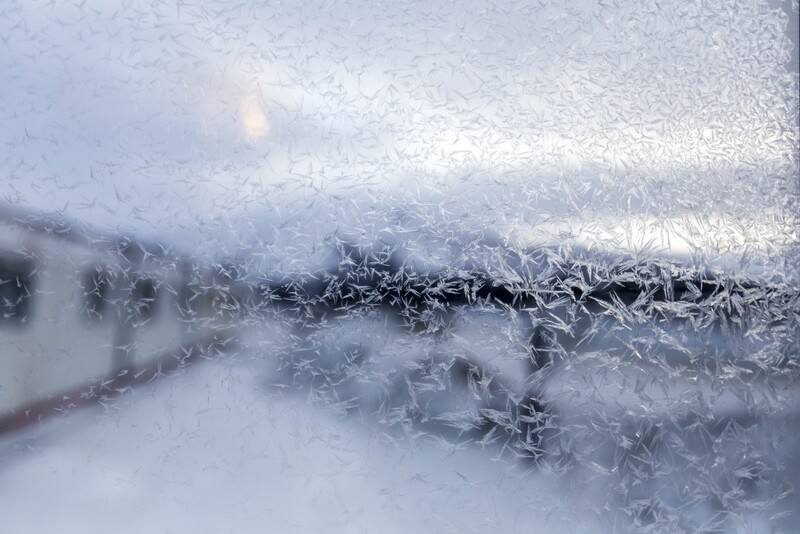 On March 10 morning, the window of camp room is covered by ice. Photo by Xuan Ma. The view of mountains inside the Arctic Circle looks like an oil painting. Photo by Xuan Ma. Half of the group soon went on an aurora viewing tour at night. A van took them to Wiseman, an ideal spot on the farther north mountain, far away from any artificial lights. As it was getting dark, the aurora gradually appeared, though it was dim and still dominated by the bright stars. The aurora in bud looked like pearl white, and slowly grew stronger concentrating its power to blossom, showing its true colors. 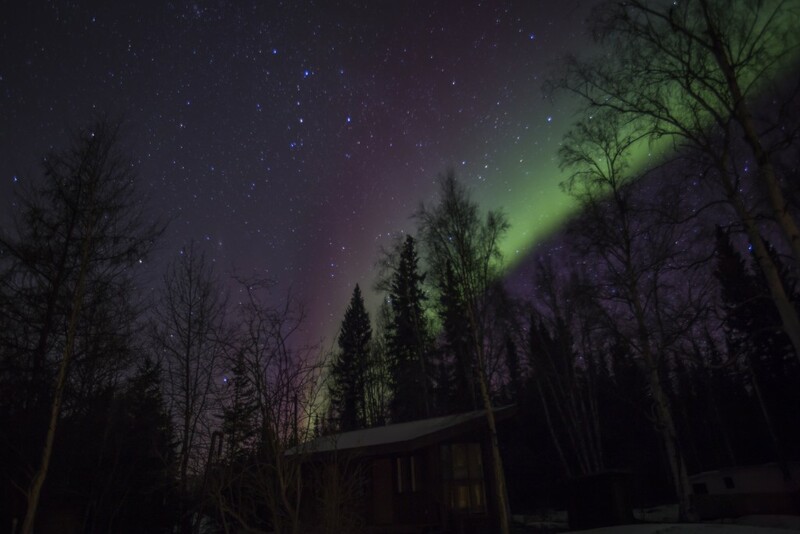 The aurora appeared in Fairbanks by the Birch Lake, on March 6. Photo by Xuan Ma. Later, it became like slightly-glowing bands of light, still static and stationary. As the lights built in intensity, the darkened color turned to green while the lights started to move and transform. When the activity grew to a greater level, they split into ribbons, floating around. Just in minutes, the ribbons gathered like crimson silk curtains hung vertically in the sky. The lights danced like curtains swinging in a light wind. The aurora at Wiseman on March 9 looks different from the one outside of the Arctic Circle. It was clear, dynamic, and strong. Photo by Xuan Ma. At the sight of this magical lights show, the group exchanged excitement with each other through a cheerful vibe of screaming and laughing. They shouted, waved hands and pointed fingers up to the sky. Frigidness forced everyone to surround a bonfire, but did not scare them away. About 20-30 minutes later, the lights began to fade. The curtains turned to torn up cotton, with the brightness decreasing slowly. The lights finally spread evenly over the sky, as if a greenish mist hung in the air. Tourists gradually calmed down, smiled at each other, and started to discuss their feelings joyfully. The experienced guide said there might be another aurora burst two hours later, but the most tourists were satisfied with what they had seen, and decided to get back. It was 1 am. The small wooden cabin on the mountain resumed its serenity. 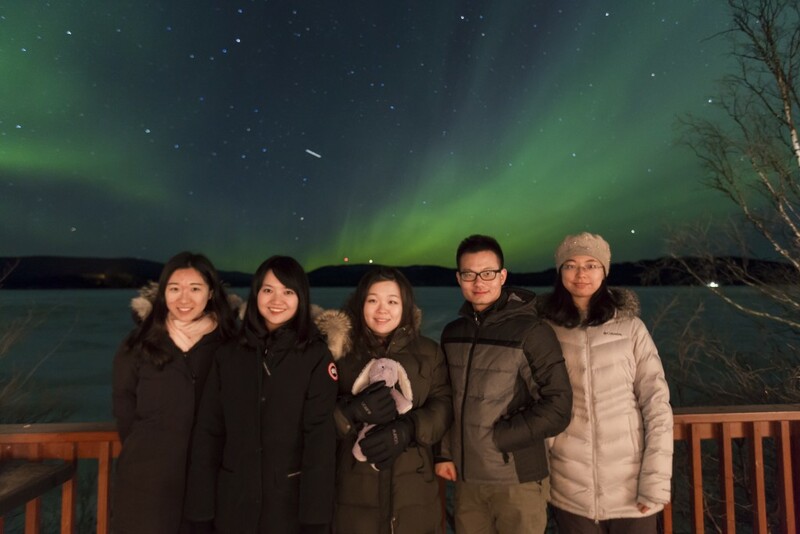 The group at the camp, under the mesmerizing Aurora. About the Aurora: Aurora Borealis is a Latin term, meaning the goddess of dawn in the North, commonly understood as another name “Northern Lights”. It is caused by the interaction of solar wind and the edge of Earth’s magnetic field. The ion particles emitted by the sun collide with different type of gases, and thus different colors are presented. 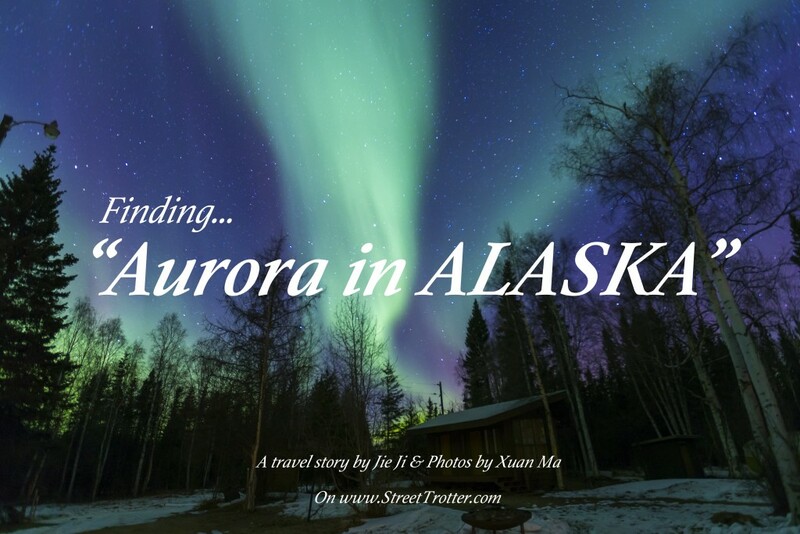 Best time to visit: According to an Alaska’s travel site Alaska.org, September until about April 20 is the right time for aurora seeing when there is the most darkness. Early spring could be a very nice choice because of the clear skies and the generally mild weather. 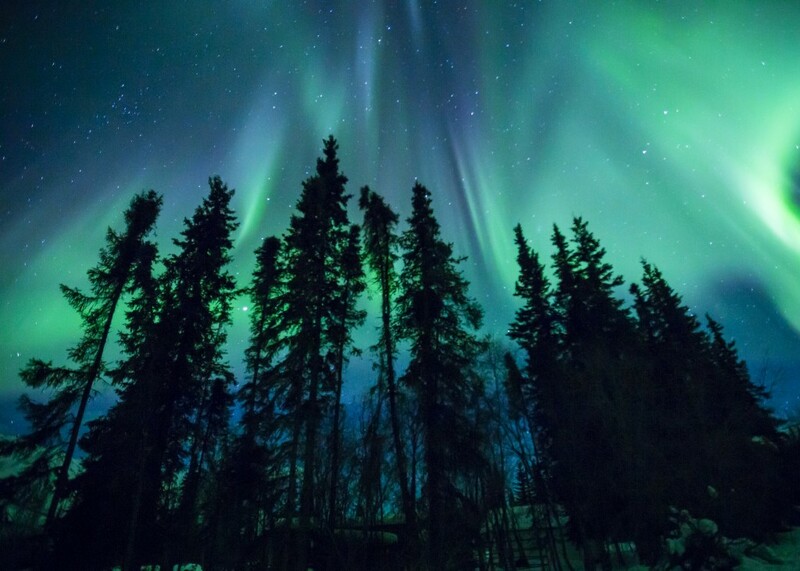 And the most ideal destination is Fairbanks as it is geographically under the “aurora oval,” an oval area where auroras are seen most frequently. Also, it is where the trip going to the Arctic Circle starts. While the aurora is unpredictable, there is forecast provided by University of Alaska Fairbanks. The institute rates the auroral activity in a scale of zero to nine. For example, a three means “moderate” and a four means “active”. Expenses: Yet it is not cheap to realize the dream of seeing auroras. The round trip flight from East Coast to Fairbanks costs at least $600, and the two-day arctic aurora seeing tour is nearly $900. There is also necessary spending on warm clothes and car rental. This old-fashioned telephone is operated by the satellite. 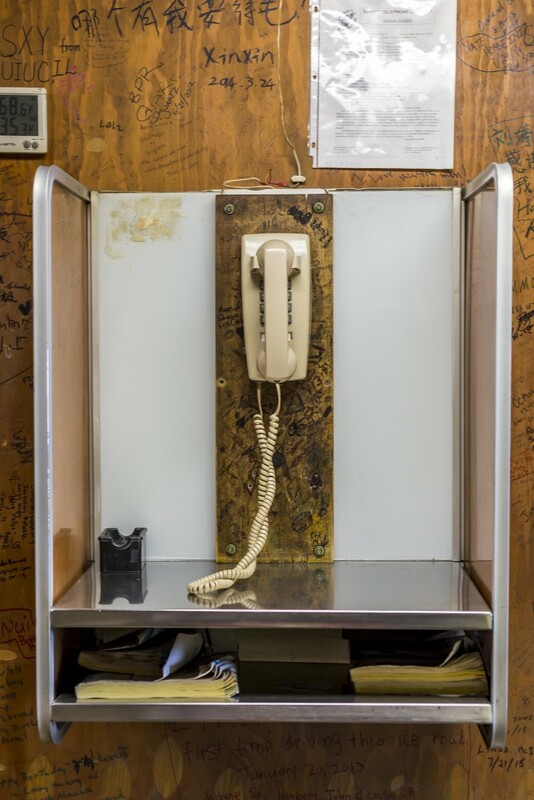 It is the only telephone line connecting the rest of world in Coldfoot Camp. Yet the satellite also provides limited internet access. Photo by Xuan Ma. Connectivity: Another fact is that any communication services other than the satellite communication could not work inside the Arctic Circle due to the strength of magnetic field. Losing connection might sound anxious, but also makes the trip a “getaway trip” indeed. About the Author: Jie Ji, is a journalism graduate student at the Boston University. 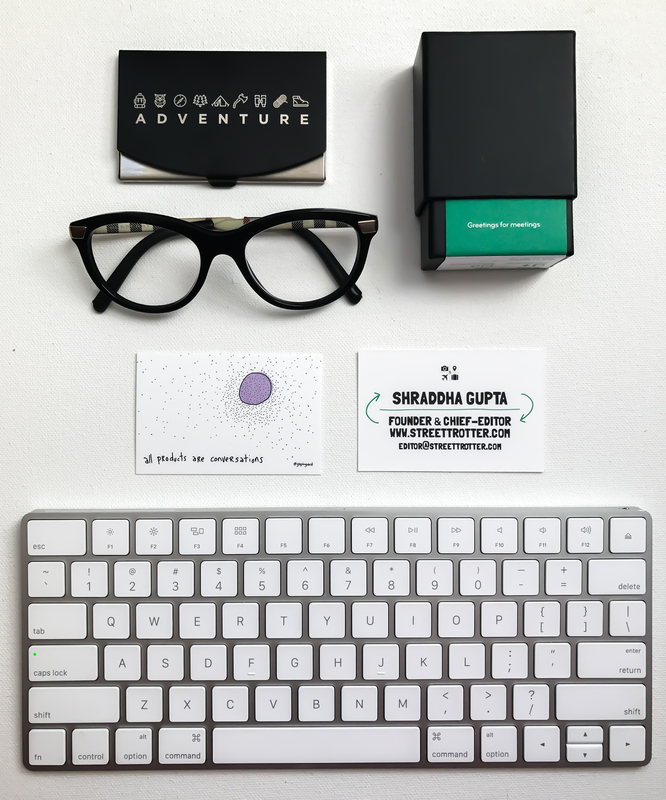 Asking and writing is her way to interact with the world. 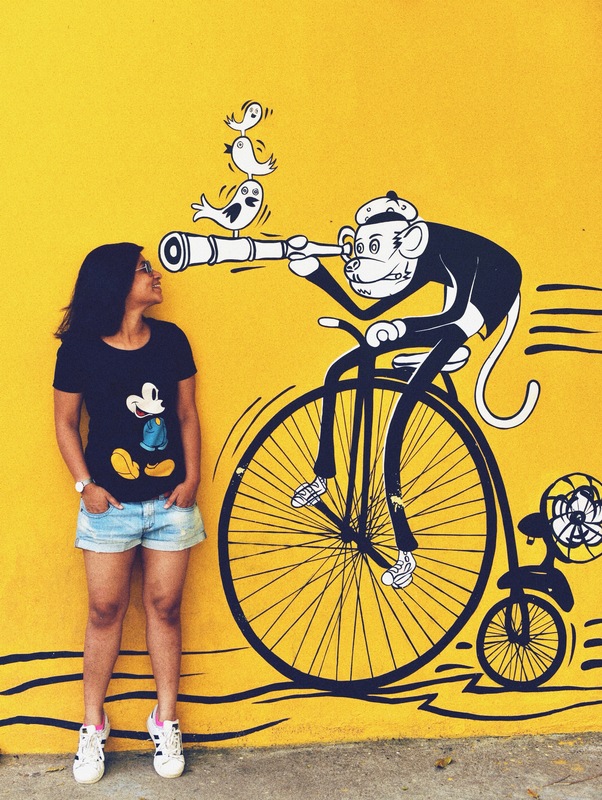 She loves reading, traveling and finding beauty in life. 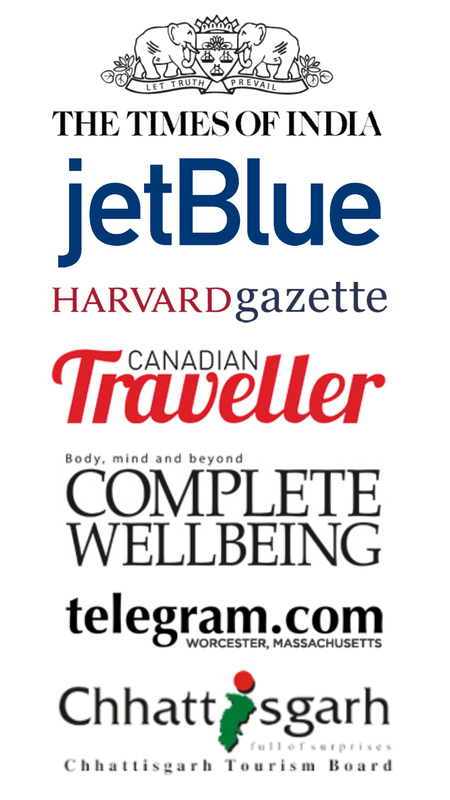 Posted in TRAVEL GUIDES, U.S.A and tagged Alaska, Alaska Tour Company, Alaska trip planning, Arctic Circle, Aurora Borealis, aurora oval, Coldfoot camp, Fairbanks, northern lights. Bookmark the permalink. What an amazing opportunity! 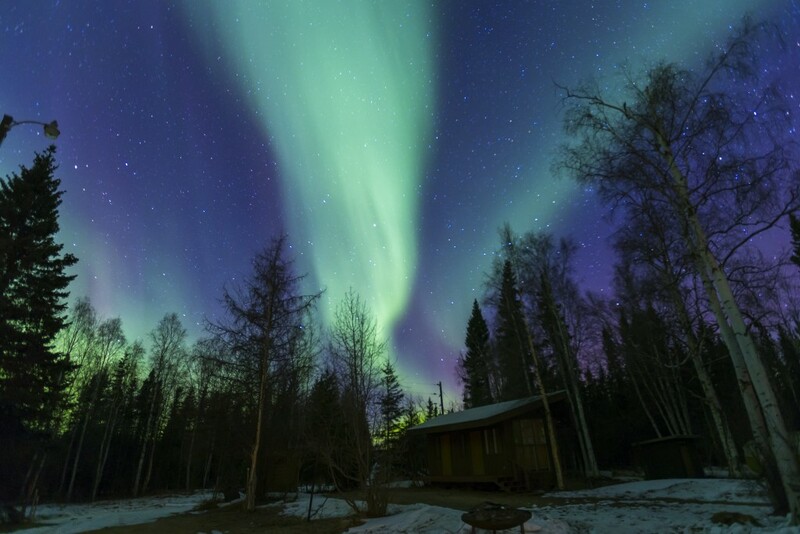 This is on our bucket list but I had not considered Fairbanks as a starting point previously. Hopefully we will get to experience it soon. Inspirational photos! We went to the Arctic Circle in the Yukon of Canada sometime August of 2009 so we didn’t get the chance to see the Aurora. You are so lucky!!! Wow, those pictures are amazing. The one from Wiseman with the trees in the foreground is amazing. But $900 for the excursion is quite a bit. Ouch! Do you know if there are any cheaper ways? I checked with my friends. When we booked the tour, there wasn’t any cheaper choice. I guess the expensive cost was due to the plane flying back to Fairbanks instead of another 10-hour bus trip. We took a small plane with only 7 or 8 seats, which was not written in my story. The flight back was pretty amazing as we saw the mountains and rivers over the clouds. We took a bunch of photos that looked like taken with a drone!